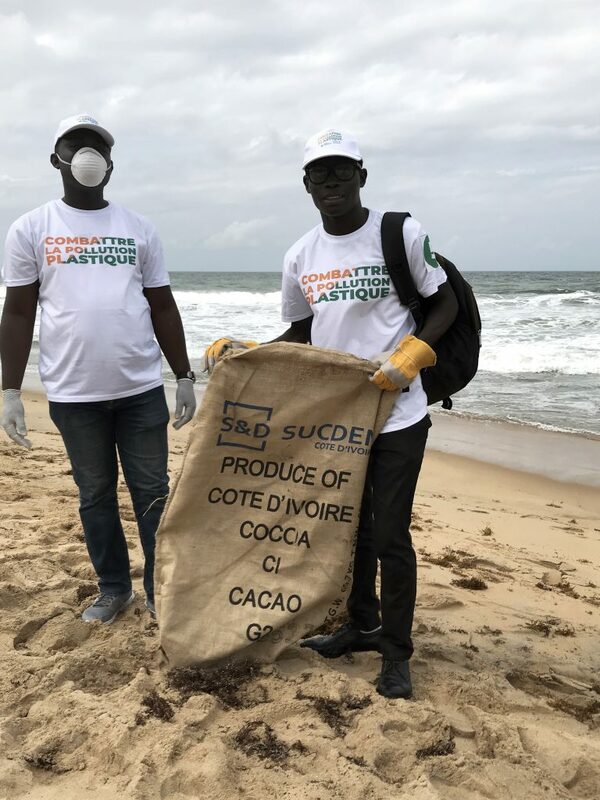 In Côte d’Ivoire, on Saturday 9 June 2018, as part of the celebration of World Oceans Day, several actions were carried out, including the cleaning of Bassam Beach by the UNEP / Abidjan Convention, the Ministry of Waste Management, Environment and Sustainable Development, as well as several other partners. This year’s World Environment Day and World Oceans Day (5 and 8 June 2018 respectively) focused on the fight against plastic pollution. 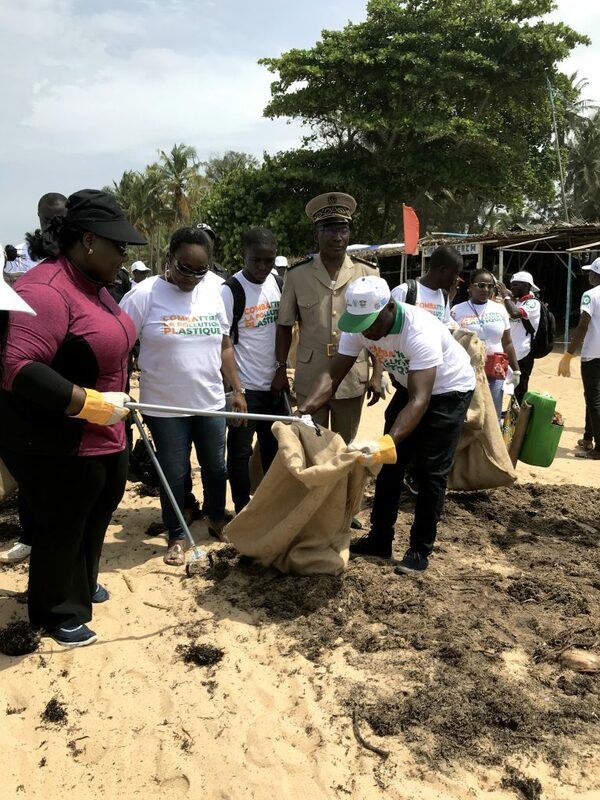 One of the highlights of the event was the clean-up of Bassam Beach in the presence of the Ivorian Minister of the Environment, Chair of the Abidjan Convention Bureau for Marine and Coastal Biodiversity in West, Central and Southern Africa. The operation was set up with the assistance of several partners, including the commune of Bassam, the traditional authorities, the Embassy of India in Côte d’Ivoire, the Magic System Foundation, the African Development Bank, the United Nations system, and private operators such as the New Interafrican Insurance Company (NSIA) and Prosuma. The band of TNT singers and comedian En K2K held the crowd in suspense throughout the event. According to Mr. Abou Bamba, Executive Secretary of the Abidjan Convention, the oceans are a precious asset and deserve more attention. The current state of the oceans is alarming. They are in fact invaded by all sorts of pollutants resulting from human activities – 80% of ocean pollution comes from activities on the continent. One of the most worrying being plastic pollution. Every year, 8 million tons of plastic waste are found in the ocean, causing considerable damage to marine life, fishing, tourism and urban infrastructure. Globally, damage to marine ecosystems from plastic waste is estimated at $ 8 billion each year. African nations are paying the greatest in terms of missed economic opportunities and major damage to infrastructure. Mrs Anne Désirée Ouloto, Minister of Waste Management, Environment and Sustainable Development, recalled her country’s commitment to environmental policy. In 2013, Côte d’Ivoire banned the use, production, import and marketing of plastic packaging. In the same vein, the country intensified its efforts to combat accidental pollution at sea, in the lagoon and in coastal areas (Plan Pollumar). The signing of the protocol for combating marine pollution from land-based sources in order to protect and conserve the marine and coastal environment is another act to be credited to Côte d’Ivoire. Finally, the country announced its upcoming membership in the UNEP CleanSeas campaign. In order to materialize their commitment against plastic pollution, the four hundred volunteers armed with gloves and masks were divided into a dozen teams to clean the Bassam beach on both sides of the hotel Etoile du Sud. At the end of the operation, all participants received water bottles and multipurpose bags. The ceremony ended around 12 pm with the participants’ commitment to relay the message for a better protection of the environment and biodiversity.